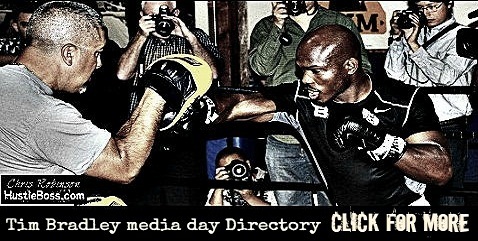 On Tuesday, February 26th, Tim Bradley hosted an open media event inside of the Fortune Gym in Hollywood, California ahead of his March 16th clash with Ruslan Provodnikov. The proud owner of the WBO welterweight title, Bradley (29-0, 12 KO’s) will look to make the first defense of his belt against the bruising Russian inside of the Home Depot Center in Carson. It was nearly nine months ago when Bradley found himself wrapped up in a little controversy, as he awarded a split-decision verdict over Manny Pacquiao that many felt he didn’t truly deserve. Despite claiming a title in a second weight division in his biggest bout as a professional, Bradley took great offense to the public’s negative feedback and admits to being slightly depressed in the months after. As for Pacquiao, he would return to the ring six months later as he engaged in perhaps the year’s best fight when he faced Juan Manuel Marquez for a fourth time. Despite a valiant effort, Pacquiao was dropped by Marquez in the third round and knocked out cold three rounds later. Asked what went through his head when he saw Pacquiao get halted in chilling fashion by Marquez, Bradley laughed heartily for a moment before answering. Bradley then elaborated a bit, turning to his strong urges to face Pacquiao in a rematch that never happened. Asked what makes Marquez so potent this late in his career, Bradley both offered praise and assessed the Mexico City fighter as a potential opponent. 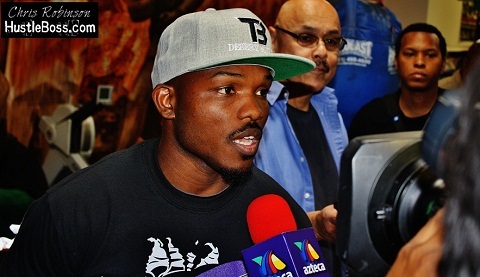 “How do you fight a guy like Marquez?” Bradley asked, repeating the question that was given to him. “Marquez is a tough guy. Man, you just got to be quick enough to get away from his counters. Marquez is a counter puncher and he waits for you, so you’ve got to make sure you double up your shots. Bradley has also expressed interest in a Marquez meeting but he likely has a full night’s worth of work in front of him in Provodnikov next month.